If you’re planning to visit Scotland then some walking and sightseeing is a must. It’s about 46 miles all the way around the island if you follow the exact coastline including over a dozen white sandy beaches, the largest of which is Gott Bay which is several miles long. There are many different routes you can take across the island or you can just follow the roads – these are typically very quiet although, being predominately single track and sometimes narrow, it’s best to step right off the road when traffic does approach. There are several places on the island you can hire bikes from or bring your own if you have room. As mentioned above, the roads are generally quiet and safe and there are plenty of opportunities to cycle off-road as well as along the beaches which is best at low tide so you can ride on the firm sand – don’t forget to bring a can of WD40 though to clean and protect your bike from all the sea air and water if you do ride on the beach. The open grassland, or Machair as it known on the island, becomes a sea of wild flowers in the spring and you’ll see plenty of hares racing across the open land all around the holiday house, as well as a huge variety of bird species such as lapwings, skylarks and oystercatchers. There is a purpose built bird hide near Kilmoluaig with a great view overlooking Loch Bhasapoll on the north west of the island. You’re also very likely to see plenty of seals close to the shore on your Scottish holiday particularly at low tide when they often gather in groups on the rocks to soak up the sunshine. There are also frequently basking sharks just offshore, often in small groups and close enough to shore to be clearly seen, slowly swimming along filtering out plankton – at about 25ft long they’re a very impressive sight however they are of course quite harmless to people in the water. 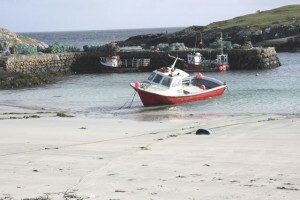 There are a couple of places such as the ferry pier at Scarinish that you are able to book boat trips to visit points around Tiree as well as sail across to some of the small islands off the coast of Mull and visit places such as Fingles Cave. 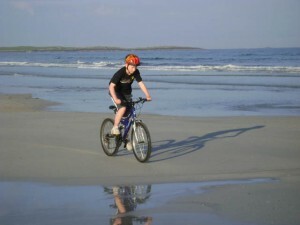 With over a dozen beaches of pure white sand Tiree really is the perfect place to stay in our coastal holiday cottage and enjoy a beach holiday with the kids. The amazing thing is that when visiting one of the “busier” beaches such as Balevullin, even on a glorious warm sunny day, there may only be a few dozen people on the whole beach!! Head to a quieter beach, such as the one literally yards the front door of our cottage, and you may well have the whole beach to yourself all day long. This shot at Crossapol beach was taken on August Bank Holiday 2011 – how many beaches in the UK, as beautiful as this one, are this quiet on a Bank Holiday? It’ll make you think differently about holidays in Scotland. 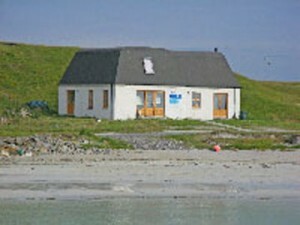 Tiree has an international reputation for the quality of wind and kite surfing available and the island hosts the annual Tiree Wave Classic event attracting competitors from far and wide. 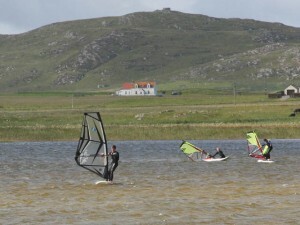 The island also boasts a very special natural facility – Loch Bhasapoll on the north west of the island which has a fantastic wind surfing school, courtesy of Wild Diamond, which is absolutely perfect for compete beginners of any age. Both our kids have had lessons there for several years since beginner stage and are now becoming quite proficient. The Loch is only a few feet deep across a wide section providing perfect conditions to allow all levels of beginners through to intermediate to get to grips with wind-surfing with very well supervised tuition, in safe conditions, even when the wind does pick up a bit. Tiree attracts a large number of experienced kite-surfers drawn by the reliable strong winds as well the excellent number of beaches right around the island allowing you to take advantage of almost every wind direction. Again there is excellent tuition available, usually at Gott Bay with its large sheltered horseshoe shoreline, through either Wild Diamond or the Tiree KiteSurf Academy. 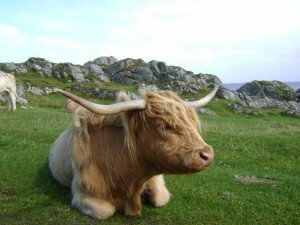 An ideal activity to try out for the adventurous whilst on a break in Scotland. 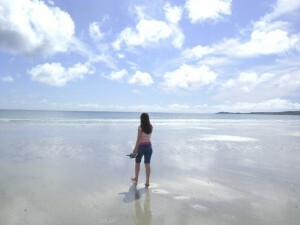 The surf around Tiree attracts a large number of surfers chasing the waves particularly at Balevullin beach. Again there is tuition available from Suds Surf School at Balevullin including wetsuit hire and surf-boards to get you going. If the kids aren’t big enough or strong enough for the wind, kite or regular surfing then there is still plenty of fun to be had in the surf with their body-boards. 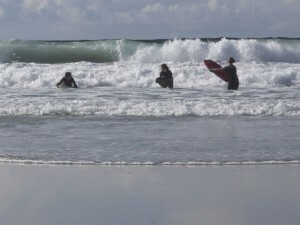 Even on calm days there is usually enough gentle surf for the kids to enjoy. One of the great things about Tiree is that with beaches all the way around the island, depending on the wind direction, you can head for whichever beach will suit you best. So, if you’re looking at coastal cottages for your next holiday then our holiday cottage in Scotland could be your perfect choice. Located right next to the airport at Crossapol, the Cobbled Cow offers tea, cake and hot snacks and is a popular place to drop in for a quick bite to eat at most times during the day and now serves excellent evening meals as well. Overlooking the west coast of the island at Sandaig, the restaurant offers a spectacular view over the coastline and with lovely evening sunsets out to sea, it’s the perfect setting for your Scottish holiday dining. The food is great, all homemade and there is an excellent menu selection available plus a good range of speciality bottled beers. Situated on the harbour wall at Scarinish, the hotel has a popular public bar together with a good sized restaurant offering a good range of delicious food. The view from the Lodge Hotel at Kirkapol, looking out over Gott Bay is a wonderful way to enjoy a tasty meal from a good menu selection. There is a public bar as well to enjoy a few pints and take in the view. Another great place to drop into for a quick tea, cake or hot snack and with a large glazed dining area overlooking the island. Easy to find on the road between Balemartine and Hynish it’s an ideal pit-stop during your holiday in Scotland. Located inland near Heylipol this is the place to come to buy a fine selection of homemade chocolates and small gifts. Very tasty and usually all gone before we leave the car park! Situated at the highest residential point on the island at Balinoe, the glass factory offers some unique and intriguing pieces of glass jewellery and artwork plus the opportunity to have a go at creating some glass artwork of your own. Only a short distance along from the Cobbled Cow at Crossapol, the Beachcomber craft centre is a great place to bring the kids to have a go at creating some of their own pottery items which can then be fully fired and glazed for you to take home with you. There is also a selection of artwork available to buy as well as frequent gallery exhibitions to view. 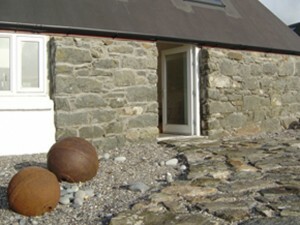 Overlooking Scarinish harbour is Dorinda Johnson’s Gallery with a wide variety of fine and interesting artwork pieces available to buy, many incorporating natural, island materials. Just a few minutes drive past the Lodge Hotel at Gott Bay, is a nine hole golf course at Vaul with spectacular sea views alongside the golf course. Golf clubs can be hired from the Lodge Hotel and green fees can be paid at the honesty box at the club house at the course. The Hynish Centre is located at the far westerly point of the island and tells the fascinating history behind the building of the Skerryvore Lighthouse, situated about 10 miles off the west coast at Hynish, and the amazing feats of engineering achieved during its construction. The highest point on Tiree at approx 450ft above sea level is home to the “Golfball” radar station (providing radar information for transatlantic aircraft) which is visible from virtually all points on the island. The summit offers spectacular views over the entire island, across to Mull, many of the other islands as well as the Scottish mainland over 20 miles away and on a clear sunny day offers the perfect view of the Tiree beaches and its coastal cottages. A short distance beyond the Hynish centre, follow the track and then the footpath around for a mile or so – as you crest the ridge you’ll find yourself in an amazing, smooth sided, grassy valley leading down to a beach where a natural sea defence of large rounded rocks and pebbles has built up into a huge wall. It’s a very unusual natural feature and well worth walking round to.